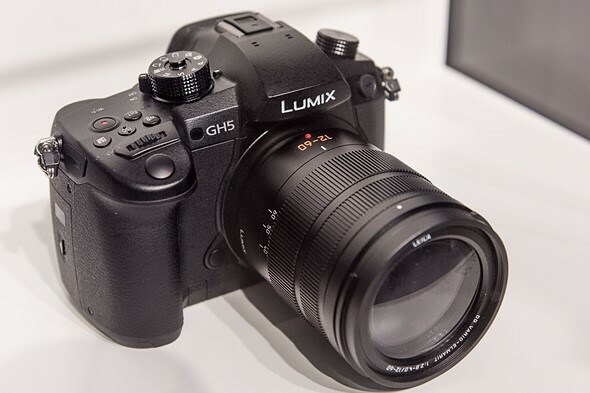 Panasonic has announced the development of a new flagship G-series camera, the Lumix DMC-GH5. It's on display at Photokina and we snapped some pictures through the glass. Mad Max 4 - the tough, high-vibration, dirty action scenes were shot with OMD-EM1s - the rest with full MARKETING frame (FMF) cameras..
Go to cinema and tell me where you can SEE the difference. (different story for stills where it is noticeable if the lens is sharp enough. Trouble is, you get LARGE lenses and 1 or 2 tiny bodies that require a ten minute menu fiddle to set the camera up. Portability was what MADE 35mm popular. That is lost with FMF equipment these days. MFT still has that portability factor. It is king. "WOW our phones are bigger and heavier this year" ??? Panasonic is abandoning the core users of the GH series: the hybrid camera users, in favor of a handful of indie film makers. And now no flash... you don't need flash for filming. We now know It does auto focus in 4K, you are talking gossip about a camera 3 months before it became available. I mostly use GH4 for video shooting on a tripod, so I don't have IBIS at my most needed upgrades' list. Personally, I prioritize bigger sensor/low light performance the most and secondly getting rid off from the extra crop factor of x0.17 (which is x0.34 at M43 sensors) while shooting 4K video which makes a 12mm pana/oly lens 28mm equivalent, but not 24mm. Although now 4K will be XK etc. with GH5 but if Pana doesn't look for a Field of View equivalence with full frame standart image then I won't see any reason to upgrade GH4. Lastly like to say that I'm very negative about variable F factor lenses. GH4 still rocks but unfortunately, I'm almost sure that GH5 will just join to the party and won't put another LP to player (no better DPR score then GH4). I hope that I got wrong impression what I read on GH5 so far. All I want to know is if it will have better high ISO performance. So 28 mp m43 camera diffraction limited at f/2.8 wow.....really? Why? Uh, it's a 20mp sensor. Are you talking about when they try for 8K? That'll be a lot bigger than 28mp, they'll need 44.2mp 4:3 ratio to cover 8K 16:9. The A7Rm2's FF sensor and canon's 50mp 5D are the smallest sensors currently with enough resolution to do 8K, assuming they could read it out fast enough in future versions. PS This may be just fine for video since the 6K will be reduced to 4K and the diffraction will be avoided up to f/5.6 for most part. I doubt the sharpness will be anywhere near A6300 or A7r2 when they downsample from 6K or 15MP (2.5K??). It depends on the implementation of this codec. As AVCHD for example, only 8bit 4:2:0 is possible. But AVC-intra (with 100 Mbit/s for HD) e.g., is 10bit 4.2:2. ProRes or DNxHD could be recorded externally. There is quite some choice of compact HDMI recorders meanwhile. Internal recording would require faster memory cards due to the huge data rates (ProRes 4K/30fps/HQ is almost 900 Mbit/s or 110 Megabytes/sec). Yeah I'd say there is not a chance of any very high bitrate ProRes type codec being recorded internally in the GH5.... does anyone know if a memory card similar to what we currently use in a GH4 is available that can even write at those kinds of bitrates? And even if it could what would be the point if it would fill it up in a few minutes,... doubt I would use it myself... would stick to a more compressed H265 type, or less compressed H264 as we do now... not good if the H265 is even more difficult/slower to edit than H264... I hope this is not the case! The Blackmagic Assist 4K records ProRes at UHD resolution onto memory cards (SDXC UHS-II, , SDXC UHS-I, SDHC UHS-I SD, DS, HS, SDR12, SDR25, DDR50, SDR50, and SDR104) so it is possible and you get about 1.6 hours on a 128GB card on UHD ProRes. I don't know the bit-rates it uses though. Yes I agree, I would always use proxies if I was doing a big job. Can't understand why some people basically decompress the video and write out massive files which their machine then has to deal with by "transcoding" from H264/h265 to ProRes or similar. Just means your machine has to hold massive uncompressed files in memory and then swaps back and forth from virtual memory on disk and all the other disadvantages of editing directly in 4K res. As a rule of thumb: The more efficiently a format compresses (resulting in smaller files to save), the less efficiently it decompresses (for playing back the video clips). Thus, H.265 will need more ressources (faster computer) to play back (decompress) than H.264. "about 1.6 hours on a 128GB card on UHD ProRes"
But it does not mention whether it's for HD or UHD. It just says: "Apple ProRes 422 HQ: 1.61 hours". In the tabe below there is no UHD format, but there is Full HD (FHD) 1920 x 1080 with 29.97 fps in ProRes HQ: Data rate 220 Mbit/sec (220 Mbps). UHD is exactly 4x the size of FHD (pixel-wise), resulting in a data rate of 4x220 Mbit/s = 880 Mbit/s for ProRes HQ UHD with 29.97 fps. 128 GByte (the size of the memory card) is 8x128 = 1024 Gbit. 1024 Gbit is 1'024'000 Megabit (calculated with "times 1000" instead of "times 1024"). 1'024'000 Megabit (size of the memory card) divided by 880 Megabit/sec (data rate for ProRes HQ UHD/29.97 fps) equals 1164 seconds = about ** 19.4 minutes (recording time for UHD) **. In Full HD it would be 4x as much: 77.6 minutes. In Full HD with 24 fps instead of 29.97 fps it would be 77.6 minutes / 24 * 29.97 which equals 96.9 Minutes, which is about 1.61 hours. The listed 1.61 hours recording time on a 128 GB memory card are meant for ProRes HQ in FHD with 24 fps (with the lowest possible demand of memory) and NOT for UHD with 29.97 fps. @geogan " And even if it could what would be the point if it would fill it up in a few minutes" SanDisk showed a 1TB SD card at Photokina so if that has the write speed and its released before the GH5 and Panasonic allow a card of that size to be used in the GH5, then that could help for recording 10-bit 4:2:2 4K footage with the GH5. @DNature. Yeah i saw that SanDisk mentioned in Photokina reports alright. Wonder how much it's going to cost! AVC Ultra does 10-bit 4:2:2 up to 226 Mbits/sec. This uses Intra-frame compression (each frame is compressed individually). I suspect they would require Panasonic microP2 cards for a bit-rate this high. Panasonic microP2 cards look like regular SD cards, but inside they're different. They use a RAID array of flash chips internally to increase speed and reliability. They're rated at 2000 Mbits/sec. AVC Ultra also supports lower bit rates for standard SDHC/SDXC cards. These formats use LongG which compress across a Group Of Pictures (GOP) like H.264/265. GOP formats look good for stationary shots, but if the frame is moving around a lot (pans, zooms, car mounts, etc), GOP starts showing a lot of compression artifacts. Also, for editing, you have to render a whole long GOP to see an individual frame of video, which makes scrubbing the timeline jumpy. And if you're doing something serious, with cuts every few seconds, a long GOP format can slow things down in post considerably. I'm probably waiting for Sony A7R III/A7S III because they are full frame and therefore offer better low light performance. Internal 4K 10-bit 4:2:2 recording should pressure Sony because those future models will look weak, if they still offer pathetic 8-bit video which falls apart, if you do serious post-processing. Decent memory cards can do 200 Mbps easily. Don't confuse MB with Mbps because MB = 8 x Mbps. Sandisk have rather cheap U3 cards which can write at 90MB/s which means 8 x 90 = 720 Mbps and it is continuous speed. They have been around at least since 2013 and BMPCC can use them for RAW-video recording. That wouldn't work, if 90MB/s writing not continuous speed. Today there is a lot faster cards like 200MB/s which can do 1600 Mbps. Memory card bandwidth is not an issue today. Okay, something confuses me: a 6K photo from a "Burst Footage". What footage mode is that? A 6K short clip? The "oh-so-boring" design of the camera body seems to be hugely beneficial for the internal thermal properties aka heat dissipation. In comparison: most Sony APS-C E-mount cameras and some of the A7 series do greatly suffer from rapid overheating, thus limiting video recording far before the (European) legal 30-min recording limit. That's not too important for those shooting short sequences and putting them together in post, but if you have to record a long lecture or interview in one piece, then you NEED a camera that will NOT stop recording due to overheating. That's why I applaud to Panasonic for doing this thing right. I really wish and hope that Sony will follow and fundamentally improve thermal properties of their smallish APS-C cameras as well. cont. : I just hope that the SNR of the GH5-sensor will be significantly better than the GH4. I have read somewhere (I think it was on 43rumors) that the sensor used in the GH5 might outperform the GH4 by a full stop with regards to low-light / high-ISO performance. However I couldn't find any indication of that in the official press releases so far. Since I am totally an "available light"-guy, I would love to see such an improvement in the GH5. I like the Pana guys..! I am surprised they didn't mention 5 axis stabilisation yet, as it would be odd for their other newer cameras to get it but not their flagship GH camera. I am quite interested in the new lenses though, especially the 12-60mm Leica. coming with the Leica name, it should be high quality. 1. What stabilisation if any, it has. 2. If it comes with no AA filter like the GX80/85 came without. 3. If it comes with V-Log L like the GH4R did. It wouldn't be right it if didn't have V-Log L as standard. Hope they fix it too so that the banding issue, green/magenta are fixed and has a bit less noise. 5. If the autofocus has been improved for video as it really needs to be. 6. 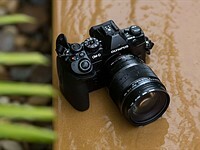 How many MP the sensor has and if it has improved dynamic range or not and more DR for photos. I heard a Panasonic rep on a B&H interview when the GH4 came out say that they couldn't have the in-body image stabilisation on the GH4 because that would interfere with the heat dissipation. The sensor needs to be fixed and physically linked to metalic heat dissipating elements to get the heat away from the sensor. Otherwise the GH4 would be limited to shorter clip lengths like most other cameras. If they can somehow get at least a 2-hour maximum clip length plus have ibis, that would be an amazing feet. But if not, I would rather have the unlimited length than ibis especially if the GH5 does indeed increase low light performance by one stop over the GH4. I've put off upgrading my GH3s until the GH5 comes out, so I'm eager see what the amazing Panasonic engineers come up with! The Leica 12-60 on that camera looks rather nice. If it has better image quality than the Pana 12-35 it will be a very welcome addition to the stable. It's a focal length range I've envied in Nikon and Olympus lenses; before m43 existed, I thought of getting an Olympus E3 with the 12-60/2.8-4.0. Yes, but I prefer the 2.8 constant aperture of the 12-35. Much better for video. I have no complaints about IQ on the 12-35. Have gotten excellent stills and videos with it. A very sweet lens. I agree that a constant f2.8 aperture makes things easier for video. My main lens on the Canon 5D Mark II is the 24-105L, and never been really comfortable with a 24-70 as a primary lens. The Panasonic 12-35 is excellent, but I do wish it had more range. Your 24-105L sounds fantastic. It is always nice to have more range for sure. But professionals have been using the 24-70 and 70-200 for a long time. They have been the standard "go-to" lens of choice. With my GH3's when I vacation, I travel with one small shoulder bag with my 7-14, 12-35 and 35-100 and everything is covered nicely with room of a Rode mic, filters, etc. I'm not saying it's the same as your 5DMkII, just different in size primarily. Shooting video and raw, the differences are very subtle, but the size difference is huge. This is what draws me to M4/3. I moved from the 5D Mark II to the GH3 for video work, and now use the GH4. At first, it was a little difficult as I was used to the wide range of the 24-105L, and had to contend with either the 12-35mm or 35-100mm. Depending on the scene and the kind of footage/composition I need, I'll use either Panasonic zoom, or one of the Voigtlander primes. But I've often wanted a wider range zoom which could roughly equal the 24-105L. The size difference between GH3/4 and 5D Mark II is huge, and the image quality is, too. Video with the GH4 is in a completely different class. We need more info on the video specs. Looks like it has the 20MP sensor, so what's the crop factor for 4K? And, does it record 10bit 4:2:2 4K incamera? Is the camera SDXC U3 capable, fully utilizing the double row of contacts? Or maybe it has a newer memory card slot (not SD). 6K is 19.4MP, so it'll be tight if it's 20MP. I wonder if they'll use the an all new sensor and go slightly higher on the res. One report I read said it takes the 6K stills from high quality video, the max quality we know the GH5 records is 4K 60, so it doesn't need 20MP sensor to do that, just some image interpolation to combine stills into a larger MP image. It seems like he GH5 brings back the multi aspect ratio sensor idea from the GH2. The sensor is 18 MP but wider than the standard 4:3 aspect ratio sensor. 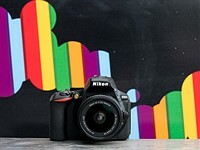 The GH2 sensor had an aspect of approx 1,45 compared to standard 1,33. "The multi aspect sensor feature means that the sensor is over-sized. At any one time, the whole sensor area is never used. But various parts of the sensor area can be used, to enable 4:3, 3:2 and 16:9 aspect ratios, while retaining the same diagonal field of view. This uses the lens imaging circle more efficiently, especially in video mode." Yes as far as I know it records 10-bit 4:2:2 in camera and 4K 50/60fps at 8-bit 4:2:2, probably because memory cards wouldn't be fast enough to record 10-bit 4K 50/60fps. Perhaps Panasonic will adopt Samsung's UFS memory card standard. Otherwise they might be considering XQD. In both cases to get the storage bandwidth up. I can't wait for it's release, so that it can dump the price of GH4 :D What more would you need from a camera? They appear to have moved the internal mic position, which is a good thing, and a bugbear of the GH line until now. The internal mics have heretofore been placed behind the hotshoe, whereas the GH5 mics are placed forward and to the front of the camera, like the Olympus E-Mx cameras. I would prefer them to be on the very front of the EVF hump, though. heretofore I had never seen an internet comment using the word heretofore. The GH5 is the new camera I'm most interested in at this point, so I'm eagerly awaiting it's full debut and hope it lives up to our eager anticipation. Hallelujah for an audio add on. Would prefer it part of the grip but happy to see them moving in that direction. Here is the thing....it must cost no more than $499. They will probably make the audio attachment $1000, and in true Panasonic style, give it the product code YGBKM - You Gotta Be Kidding Me. Hope it gets a better autofocus system - in my book the contrast autofocus system is the GH4's absolute biggest flaw. Glad they got rid of that long overhang on the EVF housing (phony pentaprism). According to the pictures, the GH5 will have the same design flaw that plagues the GH4 and GH3. Watch this to find out more and speak up to let Panasonic know you want this flaw fixed once and for all! Absolutely RIGHT. The microphone input gets in the way of the display screen, and his suggested alternate position makes sense. View the youtube video for details, and if you agree please add your voice to this request. @DPR: please some more information about the new Pany lenses! Any news about a presumable updated and enhanced DFD AF system? Am I the only one to notice the 12-60 2.8-4.0 lens !? There are also announced an 8–18 and an 50–200, both F2.8–4. The 3 zooms are a great addition to the m4/3 lens lineup. No doubt DPR will make an article for them. But it's a busy day at the DPR office I think. Been shooting with Pana since I chopped in my Nikons for an FZ50 years ago. Had excellent results ever since, and no regrets in saying goodbye to the mirror and all those lenses. I wish they could shave an inch and a half pound off this camera so is a bit smaller than Oly em5 II. THEN I'd switch to a Penny setup. No. I suspect that IBIS plus long 4k shooting times equals too much heat. So one or the other. I am worried about that, because the other new 4K cameras from Panasonic do have IBIS, but the GH series have traditionally used a heatsink design that doesn't allow for it. I don't get the point (sorry) about not having a possible 4k + IBIS. Gx80/Gx85 has both, simultaneoulsly. I don't even understand why serious camera shouldn't have IBIS. Sony new A7 line has, the new Olympus flagship has. For a good run and gun camera IBIS is a must have feature. And yes I do think that dslr or mirrorless cameras can be professional camcorders, great choice for reportages, for having both video and stills features combined. 👏👏this is great news from Panasonic I wonder when it will be out !! 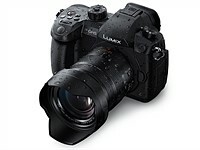 The video specs are amazing, but the photography specs of the Lumix lineup don't get the headlines they deserve. Switched over from a closet full of Canon bodies and glass a couple years ago, and no reason to look back. The GH4 was incredible on the video front, the GX8 was superior on the photo-front, and the GX85 is remarkable on all fronts considering it's tiny size and 5 Axis / dual stabilization. No question in my mind the GH5 will be the king on all fronts. Count me in! To PDAF, or not to PDAF, that is Panasonic's only remaining question. And in order to get a stills camera in Canon with 4K the minimum cost is $3500. Nikon, Fuji, Sony and Panasonic seem to get it. Anything on video autofocus? If they would upgrade the autofocus to something like the Sony a6300, I'd buy it immediately. So if Canon or Nikon came out with a 18MP camera that shot JPEGs at 30 fps, would you still call it a gimmick? Now, why would I want to shoot JPEGs, even at 30 fps? JPEGs? Really? True but today's photographers aren't generally investing in dedicated video cameras. All in one cameras are convenient, plus gone are the days of just sitting the video camera on a tripod at a wedding and leaving it to record for hours. Doing quick video clips to accompany the photos is what many people are doing for weddings. That being said I do have 3 issues about the Panasonic that kept me away from the GH4. I don't like a micro four thirds sensor. The contrast detection auto focus makes it far slower to keep up for action shots, particularly in video. I don't care for the design of the body. Very dated. Hopefully the GH5 addresses the first 2 of my concerns. Can I ask why you frequent the m4/3 section? Does it make you feel good to put their products down? Could one person be any more pathetic? I feel sorry for you. On another note, how come you have all this time to "waste" and not be signing all those master pieces you are selling at photo galleries? Please get a life. Another un-educated comment, .. Yawn! 6K??? What about IBIS? How about improved video focusing? There is a 6K photo mode, similar to the 4K photo mode on the G7. I wonder if the vagueness of the specs in some areas are because the design isn't finalized. I would have thought IBIS was a no-brainer, but is there an overheating problem with both high bit rate 4K video and IBIS? Also I would like to see better tracking of subjects while shooting video, but that's less important to me. E-M 2 where are you? In a few hours Olympus will show you. And Canon stuck with 1080 HD in 2016. What they offer is more like 720p resolution wise, full of moire and aliasing! 6K??!! Unbelievable...Who says Panasonic will NOT steal the show at the Photokina?.. They call it 6K Photo - the width of the photo is 6000 pixels, then. They say it's taken out of some 18 Megapixel "burst rate" capture (either video or serial photo - unclear how many photos/frames per second) - if it's 6K wide, it would be 3K high - 3x6=18. Image aspect ratio 6:3 = 2:1. Mathematically, k stands for 'kilo' = 1000. In memory calculations for computers it used to stand for 1024, but nowadays it's factor 1000. My Mac calculates 1 megabyte = 1000 kilobytes, 1 kilobyte = 1000 bytes (and 1 byte = 8 bit). Factor 1024 officially would be named Mebibyte, Kibibyte etc. (although seldom heard and used - the 'bi' in 'Mebi' stands for 'binary'). And in photo/video, a resolution of 2k is used for 'approximately 2000 pixels wide' (it says nothing about the height) - that could be FHD (Full HD) with 1920 pixels width and 1080 pixels hight (aspect ratio 16:9 = 1.78:1) or it could be 'real' 2K = 2048 x 1080 (aspect ratio almost 1.9:1). But you are right: 6k as 3 x FHD is 1920 x 3 = 5760 pixels wide and - with an aspect ratio 16:9 of the image - 5760 / 16 x 9 = 3240 high. Required pixels would then be 5760 x 3240 = 18'662'400. Love it. Take my money. Some of my better wildlife, dragonfly, and birding images have come from 4k grabs recently. The handling looks improved, too. Some detractors here are making fun of 6K because it SUPPOSEDLY can be recorded for just a short length of time. Some said the same things about the GH4 before it was released. As it turns out, I can choke an SD CARD on my GH4 well before the camera dies, and a single battery is good for over two hours of recording. It does record in 4GB chunks, but in the USA, at least, it doesn't stop until the card is full, or the battery dies. I can't imagine Panasonic putting a limit on 6K performance, unless local tariff laws require it. It does not shoot 6K. It only has 6K burst mode for stills extraction. @melchiorum - sleep with it then read again and come back. "...but we do know that the GH5 will offer 4K/60p"
"The GH5 will also offer a 6K Photo mode that will allow you to extract 18MP stills from burst footage, or 8MP stills from 60p 4K clips"
4K with 6K photo burst. That means it won't shoot 6K video - only short bursts of it. If not: I had (and still have) hopes for an in-body image stabilizer (for manual optics). 6k photo mode with full sensor read out I'll buy it. Why it's so ugly? Really clumsy shape. Like Zenith from Russia. I agree - I find the GH3/GH4 body more appealing. This has some awkwardly-resolved contours. I wouldn't call it ugly (more like "conservative"), but even if it was, I'd take ugly and easy to use over sleek and clumsy. Sony A cameras are beautiful, but are a nightmare to use. GH4 didn't win any beauty contests, but it is one of the most comfortable mirrorless cameras I have ever used. If you've ever used a GH4, you know the shape and control layout were designed for comfort and intuitive use. Buttons are right where they should be. You can customize the hell out of it. It just feels right, even for hours of hand-held use. And the menus are the cleanest, most intuitive I've ever used (I used to be a Canon and Nikon user). 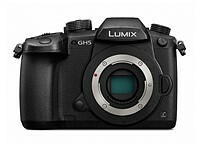 Panasonic has listened very carefully to the professional community as they've developed their last few GH cameras. They have a Lumix Luminary program, similar to Canon's Explorers of Light, where pros contribute their ideas, reactions, and experiences with prototypical hardware. They fold that feedback into their engineering and design. Looks like there's no built in flash on this model. I don't think that's a huge deal [particularly as it is quite clearly marketed toward the video crowd]. But given the sparcity of fimr specs I would have though it worth a mention at least. The benefit of 6K is zooming and panning during editing (Ken Burns effect for video), and the ability to apply excellent software image stabilization (which has to crop the original image to work) . As with 4K downsized to 1080P, the result of down-sampling to 4K from 6K during post-production is improved definition and detail. This camera will have a big niche in independent film production. GH4s are currently used by lots of filmmakers on very low production budgets, by commercial advertising producers, and by corporate video producers who double as still photographers for their training and promotions departments. The GH5 will improve options and output, while leveraging the use of existing lenses — both the 80+ native m4/3 glass, and hundreds more that can be used with adapters. m 4/3 is lens limited via nyquist limit just above 4k. for 6k you need an APS-C sensor. 6k is wasted on this sensor size. But it won't keep this camera from selling like hotcakes. That's not true. Totally depends on the aperture. You can shoot 8K at f/4 on a 4/3 sensor and still not be diffraction limited. It's more like maybe 1.4 and you need the best lens ever made. 8k is way beyond m 4/3. FLruckas - you're going to need to cite something, because every single calculation I've been able to do on this says that you're wrong. 8K resolution is 7680x4320, which is 33MP. For an M4/3 sensor, the diffraction limit at 33MP is f4.5. It's lens specific as well. Without the best lenses in the world it's a lot worse. Furthermore most m4/3 lenses start at 4.5 and go downhill from there. You'd have to shoot almost every lens wide open all the time and never zoom them to not have DL issues. Furthermore, these are cheap lenses not multi thousand dollar Zeiss lenses. Well, fortunately between the Panasonic-Leica 12mm/1.4, 42.5/f1.2, and the new Olympus PRO 25/1.2, there are some of the best lenses in the world at your disposal, so why worry? Who is going to spend $20000 to get 2-3 lenses to not be DL on this camera? Most of m 4/3 lenses don't even begin to cut it. This is just the beginning of the list. And that's why m 4/3 is DL limited for 8k. No, not only at f1.2. You can use f4.5 at 8K. You can use f6.3 at 6K. I only mentioned those lenses because they are world class optics, which you said is apparently needed. I'm sure any of the Olympus PRO or the newly announced Pana-Leica f2.8-4 zooms will also be suitable. So there's more than just the DL. Everyone is raving about 6K or 4K60p, but the real value of this camera is shooting 10bit 4:2:2 internally. Actually, it is pretty bloody impressive and makes way more difference than 6K burst mode. I just want to know the price now. I'll be impressed when it can shoot ProRes or RAW internally or export RAW. Whats the bit rate going to be for 4k 4:2:2 at 10bit? Needs to be significantly better than 100Mbps to make use of the extra colour res/depth. Twice the vertical colour resolution and 25% more colour depth. I sure hope so it's about 200Mbps. I guess we will know soon enough. I am hoping they actually include V-Log L, but I don't see why not since they offered it to GH4 users and put it in their GH4R sold in Europe. Also hoping its H.265 for 10-bit for better compression. H.265 if NLEs are updated to handle it natively. I agree it would be nice to have it as an option from the outset, but a choice of 200Mbps H264 or H265. If they're serious about video they need to give us prores. @Alex maybe its just because I do fairly simple productions, even if they do have 4k sources. I do dump in the camera's native codec (sometimes multiple cameras, multiple codecs in the same project). Editing performance is usually fine because the NLE creates proxies. I guess it slows export down a bit, but I can live with that for the simplicity. When does ProRes really help? When you have more multi-layer productions, or applying lots of effects? Prores is as close to RAW as you can get. That data transfer rate! Still using SD cards? Or are they moving to XQD or something else? Assuming the bit-rates top out at 200Mbps, SD U3 cards are fine. Is 200Mbps enough for the GH5 though? It's double what the GH4 managed for 4K. And if they need more image quality, perhaps they'll offer a 200Mbps HEVC codec? That would be pretty sweet. An 8k offering by 2020? That means Panasonic will have at least a 32mp sensor in a MFT body. APSC better step it up. The long-awaited feature-boosting Firmware Update Version 2.0 for the Panasonic GH5 is officially live! If you own a GH5, you'll want to update ASAP. The upcoming GH5 firmware update adds a number of unexpected improvements, such as more responsive autofocus, especially in 24p video shooting. How would you improve the Panasonic GH5? The Panasonic GH5 still new, but Lee Morris at Fstoppers suggests 12 firmware updates that would improve the camera.